The G21 PRO model is built from a heavy-duty chassis frame which is ideal for the professional user as it makes it exceptionally rugged and durable. Powered by shaft drive transmission which directly powers the HST via the shaft and from there to the tyres. ensuring power is maximised , and runs smoother and quieter. Fitted with a 'glide cut' 48 inch rear discharge cutting deck which works both to cut and collect the grass, the glide cut system allows the grass clippings to cut and channel the grass into the catcher, and because there is not duct either side of the deck it allows you to use the machine in tight turns. Powered by a 21hp diesel liquid cooled Kubota engine which will allow you take on the toughest commercial jobs due to its high power and high torque rise, top speed is 15km/h and with a large 500Litre collector it will enhance productivity. This machine has done 904 hours and is available to view at our Worcester branch. 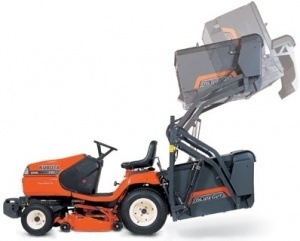 This high dump ride-on from Kubota has a 21 hp 3-cylinder diesel engine with hydrostatic transmission, a 48 inch direct cut and collect deck the convenience of high dump collection. SIGN UP FOR OUR CONTACT LIST: Click here to sign up for our contact list, to stay up to date about our offers, services & products.